'Friday Meaning' - tools to realise a meaningful life. A short series of three Friday mornings in just a little different way. followed by a group meeting in which the basic principles of logotherapy (prof. Viktor E. Frankl) will be taught. In the group meeting participants will be stimulated to sheare thoughts and experiences. 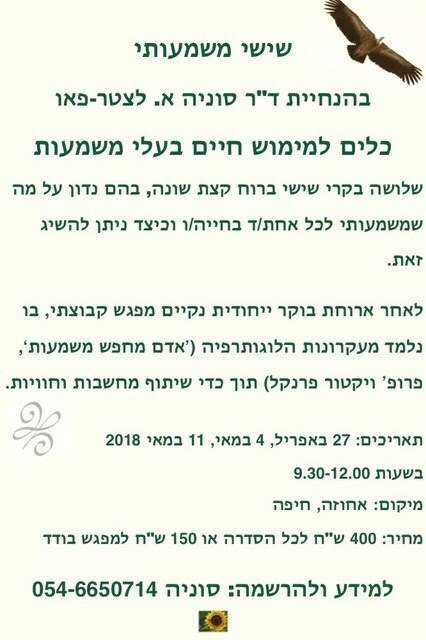 (27/4, 4/5, 11/5 2018), more details below in Hebrew. Sometime therapists ask me why there is a need for psychotherapy with elderly people and if this is not specifically discrimination of elderly people. Why should they be treated different from younger people. To our view, every age has its special characteristics and developmental stages, and here we specify some of these subjects. Retirement. At the moment of retirement, people are usually healthy and full of energy, and the question rises how to use time without being in some setting, and do something meaningful, something that gives satisfaction, pleasure and the feeling that one leaves her or his positive marks in life. The sandwich generation. The feeling to be torn between the care for an elderly parent (85 years or more), and the wish to help the younger generation, including grandchildren. How to preserve your stable and satisfying life for yourself. Transition. The profound change in life by entering a nursing home or protected living. How to preserve your self worth and your independency, when you say farewell to a long and independent life, with your own choices, freedom and your functions you had in society. Finally, coping with (chronic) illnesses, with loss, the end of life and grieve. These subjects receive their special character due to the awareness that the time one will have to live is shorter than what one has already lived. Psychotherapy for elderly people with an emphasis on Logotherapy gives powerful skills to deal with these subjects in these ages, while in the second year of the study, narrative therapy, and existential therapy are added to Logotherapy. All these achieved results remain also after half a year! home, formal caregivers, alzheimer patients. for professional publication as soon as possible. * The project was carried out in de the frame of the Center for Research and Study of Aging at the University of Haifa, with funding of this Center, as well as of Joint Israel. Furthermore, Milav, the organization who provides social-cultural services for the elderly people in Haifa, the administration personal of the University of Haifa, and the Herzelya Welfare for elderly people provided the possibility to work with their peoples. Maha Ali co-conducted with me one of the groups.